Over the last few years, spicy cocktails have found their niche; the spicy margarita, in particular, is practically a new classic. Quite a few rely on the spicy and vegetal muddled jalapeños that bring plenty of heat to a cocktail but are a bit lacking in the flavor department. Our favorite alternative? 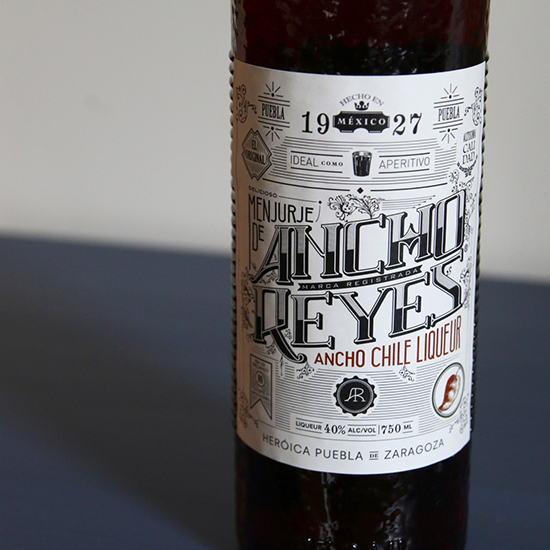 Ancho Reyes, a chile liqueur whose reputation among cocktailians is growing rapidly. Made in Puebla, Mexico, from ancho chiles steeped in a sugar cane spirit, Ancho Reyes is spicy, smoky and sweet, delivering complex flavor in addition to heat. Up at 80 proof, it's as potent as most liqueurs on your shelf and has the ability to stand alone in mixed drinks or mesh well with its friends tequila, rum and whiskey. Grab a bottle and try out these three simple cocktails. Whenever we make a new boozy friend, we love to try it out in an old-fashioned. Ancho Reyes is a little too sweet to feature here, so we're pairing it with bourbon. The result is a stiff drink whose chile flavors start out mellow and build as you keep sipping. Instructions: In a mixing glass with ice, combine 2 ounces bourbon, 3/4 ounce Ancho Reyes and 1/4 ounce honey syrup (equal parts honey cut with hot water). Add a dash of Angostura bitters. Stir until well-chilled. Strain into a rocks glass over ice. Garnish with a big lemon peel, twisting over the surface of the drink to spray its citrus oils all over. Avid juicers are all about spicy lemonade, thanks to its alleged metabolism-boosting properties; we're all about it because it's damn tasty. Lemon and Ancho Reyes are a great pair, and white rum fits in seamlessly, stiffening up the cocktail without amping up the spice too much. We'll be sipping on this one until fall. Instructions: In a cocktail shaker with ice, combine 1 1/2 ounces white rum (we're using Brugal Extra Dry), 1/2 ounce Ancho Reyes, 1 ounce freshly squeezed lemon juice and 1/2 ounce simple syrup. Shake that all up and strain into a tall glass with ice. Top with 2 ounces of club soda. Garnish with a lemon wheel. This sophisticated margarita variation uses both grapefruit and lime, a refreshing base to counter Ancho Reyes’s chile heat. For a reasonably simple cocktail, its flavors are layered and complex—which is to say, your friends will be impressed. Instructions: In a cocktail shaker with ice, combine 1 ounce Ancho Reyes, 1 ounce silver tequila, 1/2 ounce freshly squeezed Ruby Red grapefruit juice, 1/2 ounce fresh lime juice and 1/4 ounce agave syrup (agave cut with an equal part hot water). Shake that all up and strain into a cocktail glass. Garnish with a grapefruit slice.